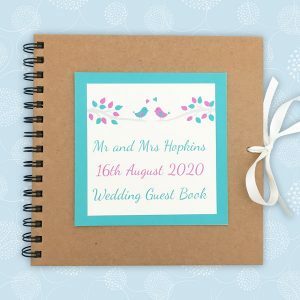 Personalised wedding guest books have had a little makeover and are now available to buy in the shop. Available in all The Leaf Press wedding designs, they also have a colour scheme of your choice. Here are some pictures! The front cover has your names. On the back cover there is a panel with your names, the wedding date and the wedding venue(s). There is a choice of ten designs, each of which is in your choice of any two colours. The end papers – the pages which join the cover to the inside block of paper – have a pattern to match the design. This gallery shows the front cover and end paper pattern for each design. Each wedding guest book is hand bound to order, using traditional book binding techniques. Measuring 21 x 22 cm, they contain 32 pages (64 sides) of unlined ivory writing paper. They are hard back, with printed front and back covers with an ivory cloth spine. There is a coloured ribbon marker and headbands to match the colours chosen. Please use this link to visit the wedding guest book listing in The Leaf Press shop. 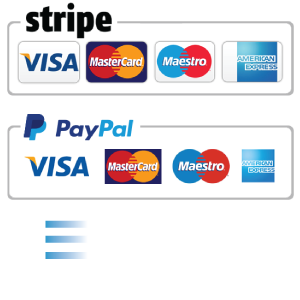 Please don’t hesitate to ask if you have any questions!